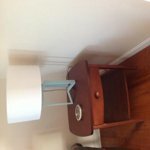 Update the look of a bedroom with the contemporary Curved Nightstand/End Table. This modern, elegant stand is constructed of solid beech wood and features a modern curved design that will blend easily with a variety of decors. 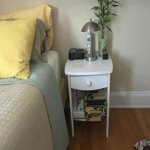 This bedroom nightstand has a spacious pull-out drawer at the top that will hold personal essentials and a shelf at the bottom that can be used as storage or display space. It has a matching comfort grip knob that provides easy access to the contents inside. The profiled top can be used to place a table lamp, a photo frame, a docking station a clock and more. 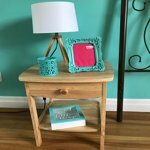 This versatile wood nightstand stand can also be used as an end table in a living room, bedroom or den. It requires some assembly and includes all of the necessary hardware for added convenience. 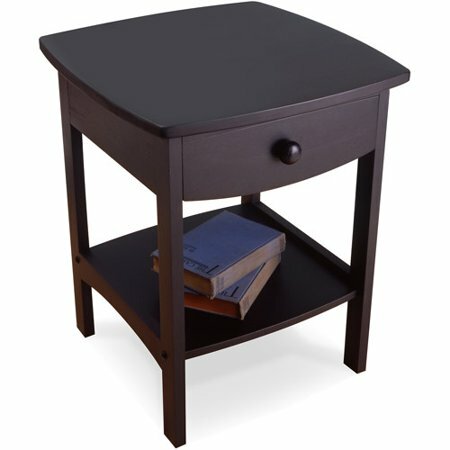 The nightstand can be used alone or with an additional curved night stand for a uniform look and feel. Additional nightstands sold separately. The unit is available in assorted finishes. Well before anything this is a great product for the price. It is a dark brown color. with enough space to put stuff in it. my only complain is when putting it all together you'll need a really nice allen key or a electric screw driver with allen tips cause this screws are really tough to put in, i don't know if all of them comes the same way but mine where tuff, it even broke the key it comes with. All in all its a nice table with nice dimensions a looks great in small places. These were just what I was looking for. I wanted a square table with rounded edges so if kiddos bump into it, it's not a sharp corner. I love that these are real wood and you can tell because they're heavy. Very easy to put together, just the right height and size. They do not look cheap like particle board tables sometimes do. 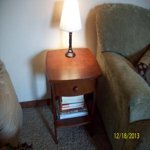 I really love this nightstand. It's the perfect size and matches my furniture so well. Assembly was really easy - very clear instructions. Glad I made this purchase! Needed tables for my camp, but would put these in my home too. They are nice looking, and were very easy to put together. My dining table was natural in color, so went with natural tables. Nice product. Nightstands are beautiful. Exactly what I wanted for guest room. Very easy to put together and I'm over 60. Instructions user friendly. Only need Phillips screwdriver for the nightstand drawers. Good quality. Highly recommend! 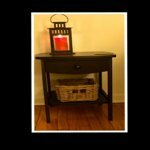 Super cute nightstands!!!! Very happy with them! 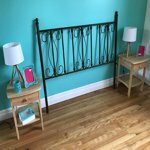 After doing an extensive research on nightstands to find the ideal for my guest room project, I finally decided to buy these nightstands that I also found in other places, but Walmart had the best deal. I confess that I was a little scared with assembling it, but I just followed the instructions and it went very well. Writing this review because I also read many reviews before buying something and it helps a lot! 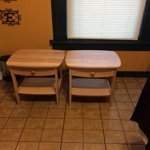 I bought 2 tables online for a really low price. (I think around $50?) They were to be used as nighstands for a guest room where I was already over budget on the bed. They were simple to put together. 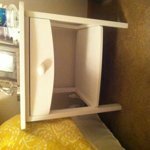 The drawers work fine and have a decent glide although not that super smooth glide you get with high end furniture. It's just wood on a wood rail so a bit rough. The bottom line... they are plain and simple so even though they don't look like fine furniture, they blend in. I found a couple of really pretty lamps at a discount store and with a beatiful bed and bedding and other things in the room, the little pop of black is all you notice. (There's a decorator theory that you should always have at least one black item in each room. 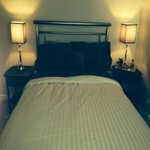 I don't know if i agree but it worked in this almost all white, sliver and gray guest room) I would definitely buy again. In fact I'm looking at a dresser in the store that is only $70 because I think with some silver paint and crytal knobs, I can transform it into something entirely different looking and no one would be the wiser! Photo doesn't do it justice and the room isn't complete but I did my best! 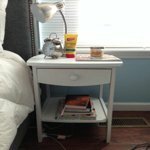 If you're looking for a cheap but good looking night stand -- this is it! I mean it's not real wood or anything but it goes together pretty easily, is sturdy, and it looks good. I thought it was definitely worth the cost. The top is definitely big enough to hold a lamp, a picture frame, my glasses, and phone. The height is okay. I wish they were an inch taller but they still work and look great. Pleased with my purchase. I returned this for the color white because the "dark walnut" look grotesque! 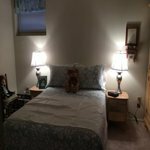 I needed something simple for the guest bedroom and this was perfect. I didn't want to spend as much but I liked the style. Turned out waiting for the color white to come in stock the price was rolled back so I did save a little. I serves it purpose.